""We really need to have more truth of the costs reflected in transport" said Dirk Flege, general director of Allianz pro Schiene. "It should not be that precisely those transport users with the worst ecological record and the highest running costs should be subsidised by the general population." The German organisation Allianz pro Schiene is calling for an extension of lorry taxes, as European regulations now allow for the assigning of external costs to the polluters, yet such a move is currently being blocked by the Minister of Transport, Peter Ramsauer. 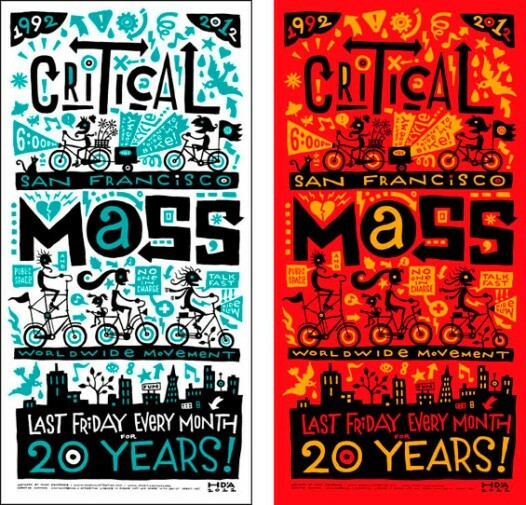 All information is on the SF Critical Mass blog, including also book order info. Poster art by Hugh D'andrade @ www.hughillustration.com. The next Sunday Streets event for San Francisco will take place in the Mission on August 5 and in Chinatown on August 26. There is a new funding mechanism available for EU countries to promote multi-mode travel in their countries. This includes support for Mobility week activities as well as financial support to honour the best Sustainable Urban Mobility Plans (SUMP). There is an opportunity to twin European cities with Chinese cities, in order to produce new models of sustainable, low-carbon city planning. This will play a part of the first EU-China mayors' forum, to take place in Brussels on September 20. CIVITAS will help facilitate the exchange. Cities interested in cooperating may contact JSimpson@rec.org. Due to the London Olympics, 95% of the Games Lanes have received a ban for cycling and bus lanes have also been removed, in a controversial move by Transport for London. A Sustrans report concludes that cycling in the National Cycle Network of the UK has risen by 18% in 2011, which is the equivalent of 40 million extra journeys by bike, the largest ever increase. At the same time, UK also reports the first increase in traffic fatalities since 2003. Both pedestrian and car occupant deaths are up, with cyclist deaths slightly down. In New York City, a new museum is undergoing development: the Museum of Reclaimed Urban Space. It features activists in the East Village who took over abandoned property as well as other stories from the glorious past of urban space reclamation. It is the brainchild of Time's UP! and currently undergoing a funding drive. Using head cameras are slowly becoming a habit among cyclists in places like NYC, where several accidents involving cars were documented by the cameras, and thus the vehicles and offending drivers could be caught. Ecotopia Biketour 2012:Towards Degrowth (6th July - 19th September) - Join us! The Ecotopia Bike Tour has just gotten underway in Barcelona. But there is still time to join! Along the route of just over 2,000km the tour will visit squats, ecofarms and growing projects, social centres, intentional communities, cycle activists and bike workshops and take part in critical masses and actions against dirty developments. The final destination is the international Degrowth conference in Venice. This fall, Venice will host the 3rd International Conference on Degrowth for Ecological Sustainability and Social Equity, between 19-23 September. Issues concerning transport and urban sustainability will also be discussed. A core of people affiliated with the World Carfree Network (WCN) plan to attend, anxious for the opportunity to network with like-minded activists, researchers and practitioners. Those interested in WCN activities may contact justin@zofi.hu. Plan ahead for the Cyclocamp in Leipzig, Germany, to take place from August 28 to September 2. Watch the website for updates and information. What are ten ways that you can wean yourself of oil dependency? The Sustainable City News offers a list of ten ways you can do so. A compelling look at personal choice. Bicycle Safety Audit Guidelines is a thick report and How-to-Guide, put out by the US Department of Transportation, which offers a hard look at the factors involved in engineering safety for cyclists on the road. The downloadable pdf is indispensable for all those dealing with cycling and safety issues in the USA and elsewhere. Check out the short film and description of DIY Zebra crossings. This was an initiative of the UK's Environmental Transport Association, which unrolled this on Green Transport Week 2012. Take a look at this photo essay of bikes and cycling in Cuba, brought to you by Bike Portland. Using the Ignite presentation format, Jon Koller advocates for carfree discounts for residents in Detroit neighborhoods, as a way to spruce up the city. The Weather Channel in the USA has documented one man's experiment in Tampa, Florida to walk to work for a week. The experiment seems to have put smiles on the man's face. World Carfree News is published once a month by World Carfree Network.